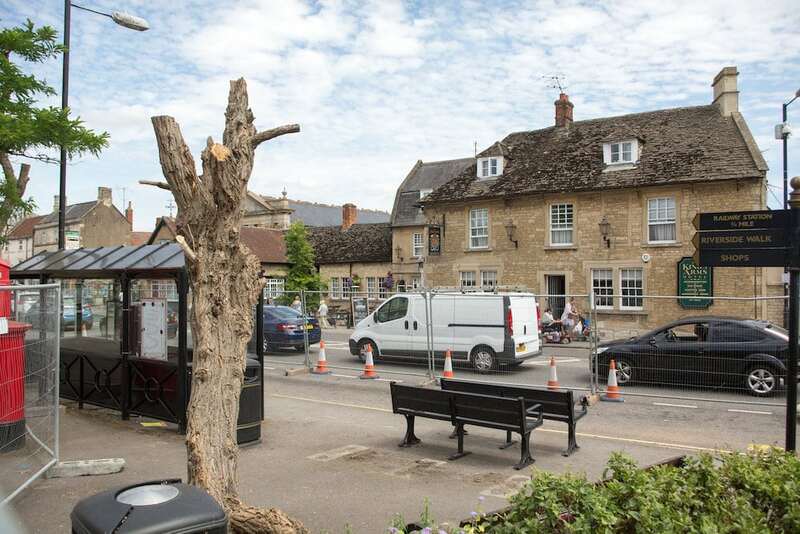 Volunteers in a well-kept market town are “horrified” after the council felled a row of trees – the day before an inspection by Britain in Bloom judges. Green-fingered locals had worked “tirelessly” to spruce up Melksham, Wilts., by planting flower beds, weeding borders and cleaning parks. 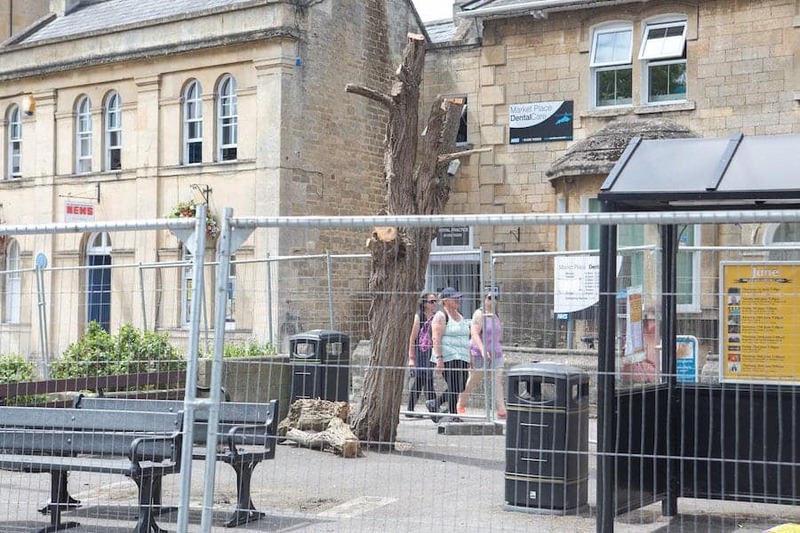 But they were furious when contractors felled the landmark trees in Market Place the day before the town was judged by the Royal Horticultural Society (RHS). 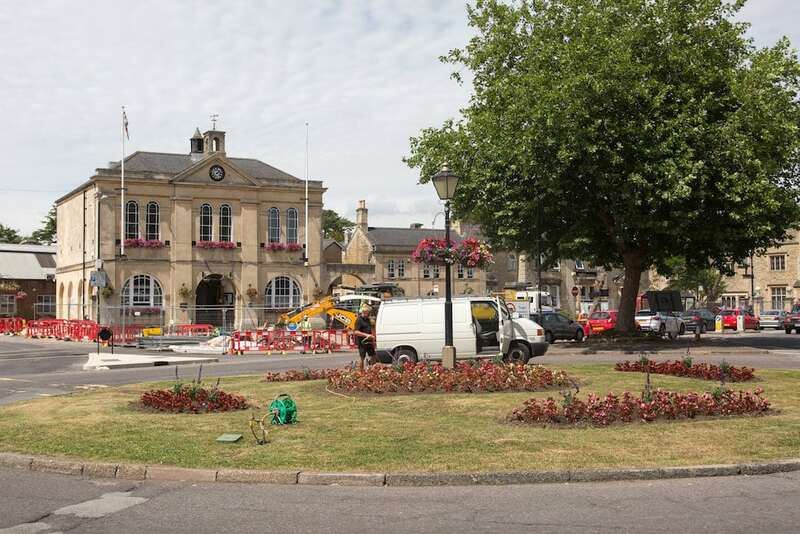 Wiltshire Council has apologised for the timing of the tree works but volunteers fear the judges will penalise the town because of its ugly central square. Kathy Iles, who co-ordinates activities for South West in Bloom Melksham, was reduced to tears when she saw the jagged stumps. “I was just absolutely horrified,” she said. “I rushed across the road and tried to get them to stop but they’re there to do the work aren’t they? 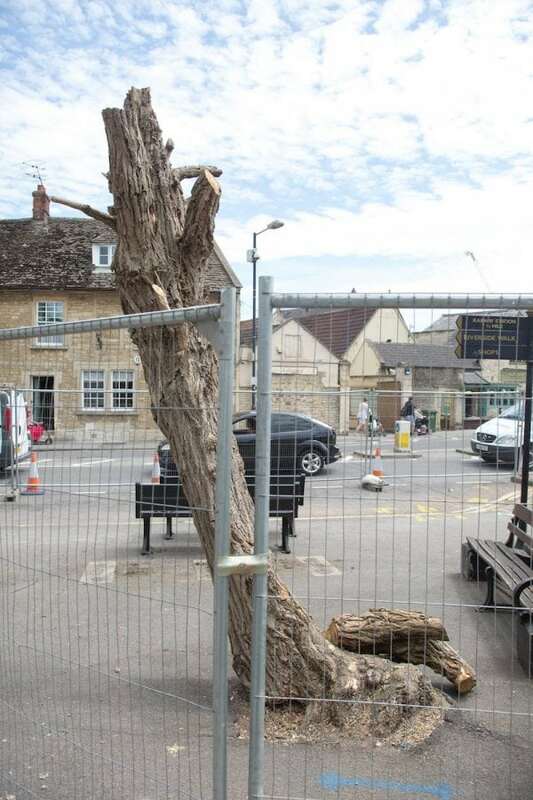 Council redevelopment of the market space which meant a tree had to be cut down the day before the judging of the Britain in Bloom contest Melksham, Wiltshire. “They haven’t even finished the job. There’s a tree stump left standing in the Market Place. A team of 20 volunteers had given up their time to boost Melksham’s chances in the competition, which has been running since 1964. The town has previously won three Silver Gilt Awards and was this year hoping to take top spot in the South West and reach the national finals in 2018. Even the local Lackham College got involved by donating dozens of bedding plants. But the two trees were felled last Wednesday, the day before judging. And to make matters worse, the RHS inspectors were being filmed by a BBC crew making a documentary about the Britain in Bloom contest. Kathy concedes that the diseased trees do need to be removed, but believes the council should have given more consideration to the timing. She said: “Our group of 20 plus volunteers had worked tirelessly to make the town looks its best for the big day. Locals fear the town will be deducted points by the judges because they “take everything into account”. Gill Hiscock commented on Facebook: “No forethought from the council, why don’t the liaise with people. And Gaile Bishop added: “Good luck Melksham – why is there no joined up thinking?? Wiltshire Council said the trees were removed as part of a planned redevelopment but hoped it “doesn’t affect the judging”. A spokesperson said: “We’d like to apologise to the hard working Britain in Bloom team and hope it doesn’t affect the judging. “We are doing all we can to make it look as nice as it can in the circumstances. “These trees were always planned to be removed as part of ongoing investment in Melksham. RHS Britain in Bloom is one of Europe’s largest horticultural campaigns which aims to crown the cleanest, greenest and most beautiful cities, towns and villages. Entrants are judged against three key criteria – community participation, environmental responsibility and horticultural achievement.